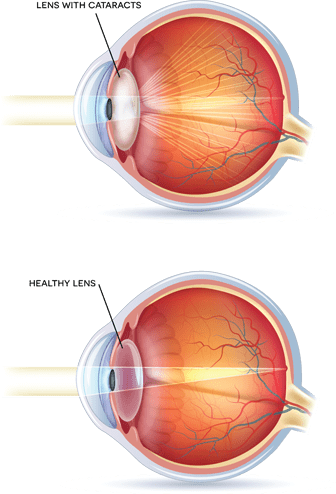 Cataracts occur when the lens inside the eye becomes opaque and cloudy, negatively affecting the clarity of your vision. The images you see will become blurred, faded, or yellowed. As you age, the lenses in your eyes become less flexible, less transparent, and thicker. The tissues within the lens break down and clump together, creating small cloudy areas within the lens. Over time, the clouding becomes denser and larger. The cataract scatters and blocks the light as it passes through the lens, preventing a sharply defined image from reaching your retina. As a result, your vision becomes blurred. Cataracts generally develop in both eyes, but not always evenly. They can cause a difference in vision between the eyes. Most cataracts are the result of normal aging or an eye injury but genetic disorders and medical conditions such as diabetes can increase your risk of developing cataracts. How do you test for cataracts? Visual Acuity Test to measure how well you can read a series of letters on a chart. Slit-Lamp Examination that uses a special lamp to focuses an intense line of light on your cornea, iris, and lens to detect abnormalities. Retinal Exam. Your doctor first dilates your eyes using eye drops and then uses an ophthalmoscope to examine your lens for signs of a cataract. When the cataract begins to affect your everyday activities, it is time to consider cataract surgery. Cataract surgery is very common and currently has the highest success rate of any surgical procedure. It involves removing the natural lens of the eye, which contains the cataract. The lens is then usually replaced with an artificial lens called an intraocular lens (IOL) implant. Cataract surgery is a procedure that is safely performed in an outpatient facility. Recovery time is quick and comfortable for this pain free, no stitch procedure. To begin the procedure a tiny (no stitch) incision is made in the side of the cornea. This incision promotes faster healing and increased comfort during recovery. The back of the lens is opened, and a special ultrasonic probe (phacoemulsifier) removes the blurred lens. A small foldable artificial lens (IOL) is inserted through the incision replacing the cloudy lens. The final replacement lens is now in place. No stitches are required to close the (no stitch) incision. The blurred vision that was a problem before the surgery is now a thing of the past. Vision is clear, and the patient can resume normal activities that may have been a challenge before the procedure. An intraocular lens is an artificial lens made of plastic, silicone, acrylic, or other material that is implanted inside the eye during cataract surgery. The implant is placed in or near the original position of the removed natural lens and vision can be restored without affecting peripheral vision, depth perception, or image size. Artificial lenses are intended to remain permanently in place, they require no maintenance or handling, and are neither felt by the patient nor visible to others. There are many lens implant options available. Your doctor will discuss these with you to determine which is best for your visual needs and lifestyle.